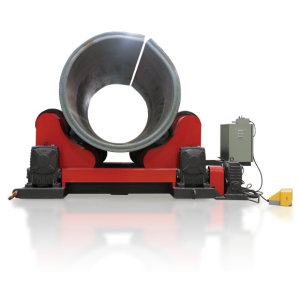 One of our popular offerings from JMT is our line of welding rotators, or tank turning rolls as they are often referred to. Capacities range from as narrow as 9” to as large as 216”, providing a wide array of compatible workpieces. Adjustable Tank Turning Rolls allow for precision adjustments to be made manually as needed thanks to a bolt-shift positioning system, resulting in numerous variations in the distance between rolls. Smaller capacity rotators, on the other hand, have a turn-screw that shifts the wheels into position. Custom designs are available to ensure that your tank turning roll meets all of your requirements. JMT-DZG tank turning rolls are self-adjusting depending on the size of the work piece, which means each pair of wheels pivots to fit different size diameter cylinders. We have tank turning rolls that can support either small or large cylinders, our capacities ranging from 9 inches up to 216 inches in diameter. Tank Rolls are available in a variety of sizes from a small 11,000 pound capacity model, all the way up to rolls that can support 220,000 pounds (110 tons).